Dan Brown's bestselling fiction thriller, THE DA VINCI CODE ignited a world-wide controversy with his opening statement... "FACT: All descriptions of artwork, architecture, documents and secret rituals in the novel are accurate." But everyone wants to know - Is the novel really fact or fiction? Was Jesus really married to Mary Magdalene? Was she one of his disciples? Did they have a child together that became France's royal bloodline? Did Catholic secret societies hide these and many other secrets about Jesus? Were famous people like Leonardo DaVinci and Sir Isaac Newton in on the secrets? Did Leonardo try to warn us through his THE LAST SUPPER painting? Discover the answers. Based on three best-selling scholarly books - THE DAVINCI DECEPTION (Erwin Lutzer), BREAKING THE DAVINCI CODE (Darrel Bock), and CRACKING DAVINCI'S CODE (James Garlow and Peter Jones) - this program solves a 2000 year old mystery and sustains your faith in Christianity. This docu-drama answers all the lingering questions and exposes all the deceptions in Dan Brown's novel - through interviews with book authors and the world's leading experts in theology, archaeology, art history, philosophy and science. Viewers will be fascinated by the new evidence that reaffirms the reliability of New Testament Christianity. This program will satisfy your curiosity, engage your imagination and provide insight for strengthening your own faith in biblical Christianity. Church-wide Bible Study for Pre-Teens, High Schoolers and Adults. 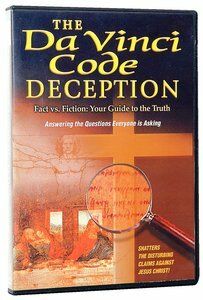 About "The Da Vinci Code Deception"